Info "Throw one enemy to another. Ah, multitasking. 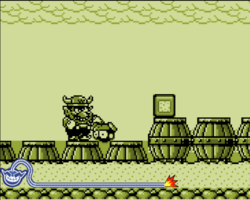 1994: Wario Land / Game Boy"
Wario Land is one of 9-Volt and 18-Volt's Microgames in WarioWare: Smooth Moves. It is based on the Game Boy game Wario Land: Super Mario Land 3. The player must raise the Pirate Goom with the Wii Remote and throw it by thrusting the Wii Remote forward. Level 1: Defeating the enemy is easy. Level 2: The enemy jumps or flies near Wario, making it harder to hit it. Sometimes, two blocks must be broken as well. Level 3: Wario usually has to keep the enemy raised to block against a falling enemy. This page was last edited on February 20, 2018, at 16:53.